Wayne Thiebaud’s tasty-looking paintings have often been mistaken for Pop Art, but the artist is after something deeper, both in art and in life. 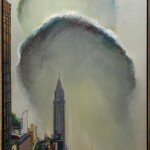 Glance briefly at a Wayne Thiebaud painting, and you can’t help but notice its subject matter—orderly rows of frosted cakes and luscious meringue-topped pies, dizzyingly tilted city streets framed with blocky apartment stacks, soaring mountain ridges lined with vegetation precariously holding on against the vertical drop. But Thiebaud’s paintings are not really about the subject matter at all, if we listen to what the artist himself has said about them. Rather, he sees each new painting as an opportunity for him to confront anew the classic problems of painting—the making of an illusion of 3-D space on a 2-D plane using fluid materials, specific tools and an unfailing supply of physical, intellectual and emotional effort. Considering that Thiebaud, who is 93, has been confronting those classic problems and putting forth answer after answer to them for over six decades makes his work all the more remarkable. Our present cultural moment of accelerating technological capabilities has resulted in lives filled with fleeting images, virtual objects, superficial interactions and a prevailing sense of instant everything. We recognize that there is no going back and precisely because of this, we need creative artists in all media who can engage us with the material world, where real things are created by hand through physical labor. We need makers whose efforts compel us to stop and look closely at the fluid beauty of a brushstroke across a textured canvas, or the visual vibration of two complementary colors purposefully laid next to each other, or the graphic perfection of a triangular slice of layer cake. We need empty moments of time and space to restore ourselves both physically and emotionally so that we can develop the empathy that Thiebaud has identified as one of the most important goals of art-making. Much of the art that is capable of capturing and holding our attention long enough to generate feelings of empathy and connection is not wrapped up neatly and finished to perfection. These are works full of subtle contradictions and open-ended questions that we can project onto and puzzle over. Trying to work out the answers is what keeps us coming back to this type of work time and time again. Along with the visual delights that a Thiebaud painting delivers, the artist leaves us with a stimulating tangle of contradictions and questions. 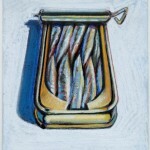 Thiebaud has made these magical aspects work for him. 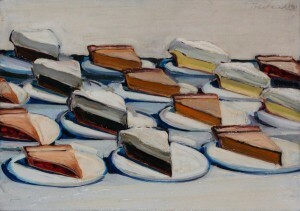 At the same time, a Thiebaud painting can be both a direct representation of a refrigerated case of cakes and pies and an abstract arrangement of pure geometric cylinders, discs, cones and parallelograms. It can be both a solid construction of static forms and a dynamic experience in which objects literally vibrate off the picture plane (an effect called halation). It can be both completely serious and mature in its handling of paint and playfully surprising with its twisted perspective on a familiar subject. It can be both a singular iconic object or figure and a limitless series of multiples and variations on a particular theme. It is by embracing these contradictions and through his sustained engagement with materials that Thiebaud’s work gathers its power. The act of continually re-addressing the painterly problems of representation, composition and materials has sustained the artist throughout his productive and lengthy career. Artists cannot create a convincing 2-D artificial reality unless they have mastered the tools to do so. Over the years, Thiebaud has kept his drawing skills honed and his muscle memory sharp by repeatedly sketching multiple views of his subjects as the first step in the creation of new work. This, of course, is the classical iterative method of art training, beginning with the humble tools of graphite, ink and paper. Even today it is the way that painting is taught—through sketching, repetition and refinement. Thiebaud approaches his own work as well as his teaching in this way; he continues to teach and model the creative process for developing artists, as he has done ever since he joined the faculty at the University of California at Davis in 1960. He retired from full-time teaching in 1990 but has continued to teach as Professor Emeritus since then. Teaching studio art is a creative practice unto itself that involves intense awareness of one’s own process and an obligation to deconstruct your working methods and communicate clearly so that students can learn by example. 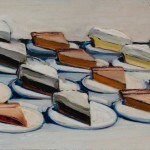 But the benefits are reciprocal—Thiebaud has often talked about how teaching has fed his own curiosity. He has consistently discovered new ways of thinking about the challenges of painting thanks to the fresh perspectives that his students have brought to the conversation. Teaching also provided professional and financial stability and afforded Thiebaud the luxury of not needing to create work for a fickle art market because his primary livelihood could come from teaching. Many California artists of the time benefited from the same protection: Elmer Bischoff, Richard Diebenkorn and David Park taught at the California School of Fine Art (now the San Francisco Art Institute), Nathan Oliveira taught at Stanford University, ceramists Peter Voulkos was at UC Berkeley and Viola Frey was at California College of Arts and Crafts (now California College of the Arts). Thiebaud’s colleagues in the UC Davis art department included ceramist Robert Arneson and painters Roy De Forest, Manuel Neri and William T. Wiley. There is freedom and autonomy that comes with not having to produce work for the market, though Thiebaud’s early gallery success ensured that he would be able to live quite comfortably. His first one-man show of still life cakes and pies at the Allan Stone Gallery in New York sold out completely, resulting in purchases by MoMA and notable collectors as well as critical acclaim from the art media. Many of the accolades focused on his vernacular subject matter, and as a result his early work has always been associated with the Pop Art phenomenon, although Thiebaud insists that these paintings have been misunderstood. The choice to paint cakes and pies was more about a physical reality ripe for painterly exploration than a Pop Art cultural critique on consumerism and emotional detachment. From the very beginning his project has involved the physical, material and intellectual practice of creating the illusion of space, form and light, and as such, his work is more aligned philosophically with modern “painter’s painters” such as Pierre Bonnard, Mary Cassatt, Edgar Degas, Vincent van Gogh, Giorgio Morandi and Edward Hopper than is was with Pop artists such as Andy Warhol, Roy Lichtenstein and James Rosenquist. For Thiebaud, the creative process involves a great deal of hard work and numerous iterations, a deep engagement with materials and the ability to put fear aside and risk failure at every step. 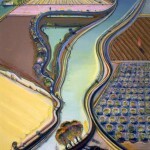 In this way Thiebaud is a “painter’s painter,” too. He goes about his work in ways that other artists respect—he works hard in the studio, he constantly questions and refines his technique, he takes compositional risks large and small and he allows himself to fail. The artist sketches on location, capturing the likeness as well as the mood of a particular site, whether it be a mountain, a ridge or a river basin. These site studies are done over days, weeks and months and often take particular account of the ephemeral effects of light and weather—seasonal conditions, light qualities, cloud formations and shifting shadows. Then, back in the studio, he combines the views into a variety of unified compositions, often showing multiple perspectives in a single picture plane. Paul Cezanne was a master of the simultaneous perspective and it deeply influenced both Pablo Picasso and Georges Braque as they explored analytical Cubism together in the early years of the 20th century. But rather than through Cezanne, Thiebaud comes by this effect through Hopper, who developed the technique of combining a variety of sketches into a unified cityscape to capture the resonant feeling of place that goes well beyond pure representation. This is the prerogative of the painter acting as a designer of imaginary worlds with a logic and beauty all their own. The Memory Mountains exhibition—consisting of 31 paintings and 17 works on paper, including 15 large-scale works completed in the past two years—provides ample evidence of Thiebaud’s unstoppable curiosity and engagement in art-making. These paintings and the accompanying sketches are windows into the creative process that has sustained the artist in his life-long attempt to resolve the problems of painting. 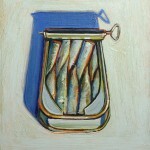 There has never been a better time to think about Thiebaud’s work. Ever the teacher, he reminds us that “particularly today we’ve rushed past so many things so quickly…[I believe] you’ve got to stop, you’ve got to stare, you’ve got to make some sort of critical evaluation.” Our experience of the world has become so digitized, branded and screen-based in our often unsuccessful search to satisfy our desires or live out our dreams. We spend more and more time consuming “content” and attempting to turn “data” into wisdom. We have swapped thoughtful contemplation for the immediate acquisition of superficial things, while at the same time we express concern, ironically enough, about the loss of meaning and authentic experiences in our lives. At times the situation might seem insurmountable, but there are many who are working against these tendencies. We see it in the slow food movement and Edible Schoolyard project led by Alice Waters in Berkeley, Calif., and in the growing support for local producers and products. It’s also visible in design projects that engage communities to help solve local challenges such as Emily Piloton’s Project H in Bertie County North Carolina. Projects such as these give us hope, in part by teaching us best practices and holistic thinking. Art can also point the way forward and provide valuable models for focused problem-solving and insight into the nature of the creative process itself. 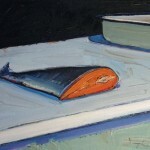 Artists and teachers like Wayne Thiebaud who have sustained their interests and passions over time by constantly evolving (but not fundamentally veering from) their vision—it is these people who can give us visions of reality that reveal richness over time and that reward our closest observation. We need slow art, humble art, art that is sustainable for the creator and the audience and Thiebaud offers us all these in abundance.